Sure enough, Steven Farmer in Animal Spirit Guides, includes Sparrow. He suggests the presence of Sparrow is a signal to look for the nobility in the most common of things, including yourself. 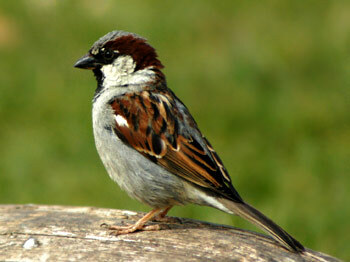 Sparrows are a very common bird. They flourish where other species fail. The don't seem to mind the rain and snow and extremes of weather. They don't fly off and look for an easier place to rest. They know their self-worth. They are evidence that even a little bird can triumph. P.D. Eastman wrote and illustrated a wonderful children's picture book in 1960 called Are You My Mother?. In the story a mother bird sitting on her egg in the nest feels the egg about to hatch and goes out in search for food for her new arrival. While she's gone the egg hatches and a small bird (that I'm going to take as a sparrow!) is born with a big attitude. He doesn't decide he's abandoned when his mother isn't around, he doesn't worry about where she might be, he just takes off in search of her. He knows she must be looking for him. He never doubts that. Having never seen his mother (or himself) he has no idea what his mother looks like so he keeps asking everyone, and thing, he meets if they are his mother. He encounters a cat, a hen, a dog, a cow, a boat, a plane, and finally a bulldozer before he finds his mother. It works out in the end, but I won't spoil the surprise. The point is, this little sparrow (I think) has full confidence in himself. And that never wavers no matter what anyone says to him. He can't fly so we walks; with his head up, full of poise and self-esteem. And that's the energy of the sparrow. Farmer writes that Sparrow energy is a signal you might be in very productive and prolific times. I think that speaks to the energy cycle we all seem to be in. During this time of intense change and rapid energy, it might be wise to draw on Sparrow energy to remember you can hold hold your own, be a survivor, comfortable wherever you happen to be. Whether that's safe and secure in the nest, or walking along a dusty road looking for a connection, it's all about the unshakable belief in self. You might want to try some peppermint cheesecake like Rachael did in Sweet Shack & Bach Bar, http://pixiedusthealing.blogspot.com/2011/12/its-here-sweet-shack-bach-bar.html to help you sing. Bach Flowers might help you as well. Rachael tried Mimulus, Agrimony and Cerato. Or you might want to just curl up with a good book sheltered from the storm of energy, safe and secure in yourself and your place in the world. Even the littlest bird has a great song to sing. Labels: animal sign sparrow self-worth self-esteem children's book Are You My Mother?